Thompson Design Group, 35 Channel Center St. The Common Boston cocktail party, held at Thompson Design Group, celebrates good work by community advocates and local architects, and lubricates good conversation between them. During the party, we’ll be debuting the work of the Neighborhood Photography Project, including images by photographers and community members in Ashmont, Jamaica Plain, Fort Point Channel, and Chinatown. Also on display during the event, Studio Soto will present an exhibition of photographs by Mobius Artists Group member Bob Raymond, who has been documenting Mobius’ activities for nearly thirty years, and an installation by Wenxiong Lin. 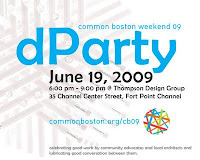 Common Boston Weekend 2009 is June 18 through 21! Common Boston Weekend—Boston's only free, public festival of neighborhoods and design—celebrates the city June 18 - 21st. Conceived as a community celebration of architecture and design, Common Boston Weekend consists of more than 40 open buildings, neighborhood tours, exhibits and events concentrated around four Boston neighborhoods: Ashmont, Jamaica Plain, Chinatown and Fort Point Channel. Highlights include open architecture studios, a guided walk through Franklin Park, an audio tour of Berkeley Street Community Gardens, bike tours of Jamaica Plain and Dorchester, and food tours. Visit www.commonboston.org for a complete schedule of events. All events are free and open to the public.